In Tung Tau Wai village (東頭圍村) in the Wang Chau (橫洲) district of Yuen Long, lies an abandoned British style mansion by the name of Yu Yuen (娛苑) which became the subject of many unsubstantiated ghost stories. The mansion was the summer villa of Tsoi Po-tin (1877-1944), who was not only a community leader in the New Territories as a co-founder of the Heung Yee Kuk and Pok Oi Hospital but a leading building contractor in Hong Kong in the 1920s and 1930s whose Wing Yick & Co was responsible for the construction of many public and private buildings all over Hong Kong, Kowloon and the New Territories. Many of these buildings sadly had been demolished over the years but a few of these buildings still stand – such as the Yu Yuen mansion, the Shek O Country Club clubhouse (built in 1925), the Sham Shui Po Police Station (built in 1924) and the Matilda Hospital. Tsoi was a native of Tung Tau Wai village and was born and grew up there before the British took over the New Territories in 1898. Starting out as a construction worker, it is unclear as to when he established Wing Yick &Co but it was definitely before 1920 when he co-founded the HK Building Contractors Association (now HK Construction Association, he was vice chairman in 1930) with 17 others and many of his fellow villagers followed him into the construction business. A Court case shows he purchased land in Tai Po in 1917. In 1915, he was involved in the formation of the Yuen Long New Market (元朗新墟) and in 1919, he was one of the founding directors of Pok Oi Hospital in Yuen Long and later served as chairman of the group in 1931-32. In 1925, Sir Cecil Clementi (1875-1947, who was a friend of Tsoi since his days as a colonial officer in the New Territories earlier in his career) became the governor of Hong Kong and working with Tsoi and other indigenous leaders of the New Territories, the Heung Yee Kuk was formed in 1926 as the official body for New Territories leaders to work and negotiate with the colonial government for the welfare of the people of New Territories. 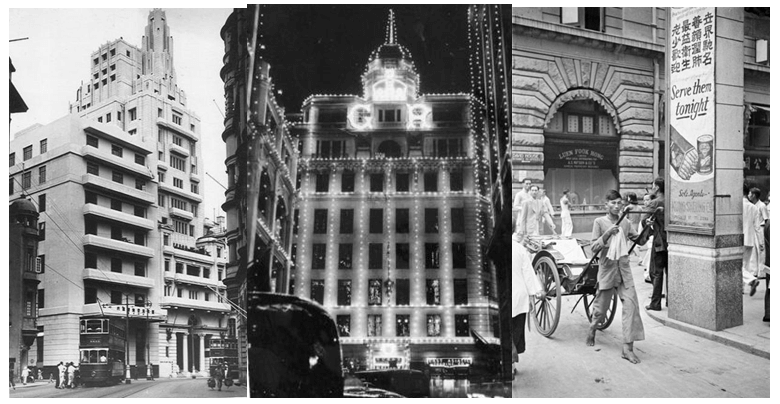 As shown in the 1927 ad and article above, by then Wing Yick was involved in many projects in Hong Kong island and Kowloon such as the Morning Post Building on Wyndham Street in Central (completed in 1925) and was even awarded the contract to build the pavilion and decoration for the visit of HRH Prince of Wales (later Edward VIII, Duke of Windsor) which it completed within 2 and a half months in 1922. The article also mentioned that Wing Yick was the general manager of the Sham Mow Saw mill in Hunghom. Not much info is available about Hunghom except for an entry in a 1938 directory which listed 1A Percival Street as its office address, the mill being located inHunghom (precise address not listed) and there was a branch in Canton at 12 C.K.R. Road. As a firm, The Sham Mow Timber Sawmills Co Ltd was incorporated in 1922 and dissolved in 1956. From an essay on the history of the HK construction industry written by long-time veteran Tam Shiu-hong (to be covered) for the HKBCA yearbook in 1954, Wing Yick& Co was also responsible for the construction of at least four major office buildings in Central in the 1920s – David House (built in 1923, 67-69 Des Voeux Road Central, demolished in 1963), Oi Kwan Building (built in 1925 at 63-66 Des Voeux Road Central for Oi Kwan Life Assurance, since been demolished – Nan Fung Textile’s D.H. Chen’s first office in HK was located there; Tsoi was allegedly involved in the construction of Oi Kwan Building in Canton which was the tallest building in the city from 1937-1967), Asiatic Building (built in 1928 for Asiatic Petroleum at 24-31 Queen’s Road Central, renamed Shell House in 1930 and demolished in 1958; now Central Tower) andKwok Man House (built in 1929, 8A Des Voeux Road, name derived from the developer of the building – the National Commercial & Savings Bank which was founded by the founders of Sincere & Co; since demolished and became part of New Henry House which opened in 1967). In the 1930s, Tsoi was an active philanthropist. In addition to Pok Oi, he was director of Po Leung Kuk in 1934. After the outbreak of the Sino-Japanese War in 1937, he was also involved in refugee relief not only in New Territories where many refugees had flooded in from the mainland but along villages of the Kowloon Canton Railroad line in Guangdong province which was under attack.During the Japanese occupation, he was appointed leader of the Yuen Long district by the Japanese military administration and he died in 1944 while HK was still under Japanese control. After the War, Wing Yick& Co was no longer active. Tsoi allegedly had at least four wives and over a dozen children. While he and his family were living in Causeway Bay, he built the Yu Yuen mansion in his home village in 1927 as their summer home. Allegedly Governor Clementi had visited the mansion where the British flag was raised and in 1935, burglars broke into the mansion and $2000 worth of property was stolen but fortunately no one was hurt. In the 1940s, Yu Yuen was regarded as one of the four private estates in the New Territories back in the 1940s, the other three being General Li Fook-lam’s Hong Lok Yuen in Tai Po, Sir Robert Ho Tung’s villa in Sheung Shui and Pun Chun Yuen in Tai Po, which was developed by Wong Sze-wai of Wing Lee Wai Distillery (see article). In 1991, his family sold the Yu Yuen mansion to a consortium led by New Territories leaders such as Lau Wong-fat, Chan Yat-sun and 2 others, who for whatever reason never re-developed the building. Left: the main gate of Yu Yuen; Right: the abandoned Yu Yuen mansion in the 2000s. This article was first posted on 28th January 2019.